Managing your energy is far more important than just managing your time. Keep a log of how you feel during the day based on your energy level. Over time see how hydration, nutrition, sleep, training and work schedules impact your energy. Then, make adjustments to maximize your overall energy level, and make sure that your key activities during the day are aligned during the times when you have the most energy to give. For example, I know that hydration has a HUGE impact on my energy level. I also know I tend to have the most energy between 9-Noon. After noon (and until 3-4pm or so), I’m essentially useless 🙂 . Later in the evening, I get a second wind around 9-10pm but if I take advantage of that I will pay the price by feeling awful the next day. Knowing this I focus on getting creative tasks at work done in the morning before lunch, and do my training in the evening around 5-7pm. I carry a water bottle with me and hydrate constantly during the day – especially when teaching lots of yoga or training more in hot weather. I don’t believe that it is necessary or even possible to feel awesome ALL of the time. Instead, strive to do your best to feel good MOST of the time, and focus on making use of that productive time to do something worthwhile. 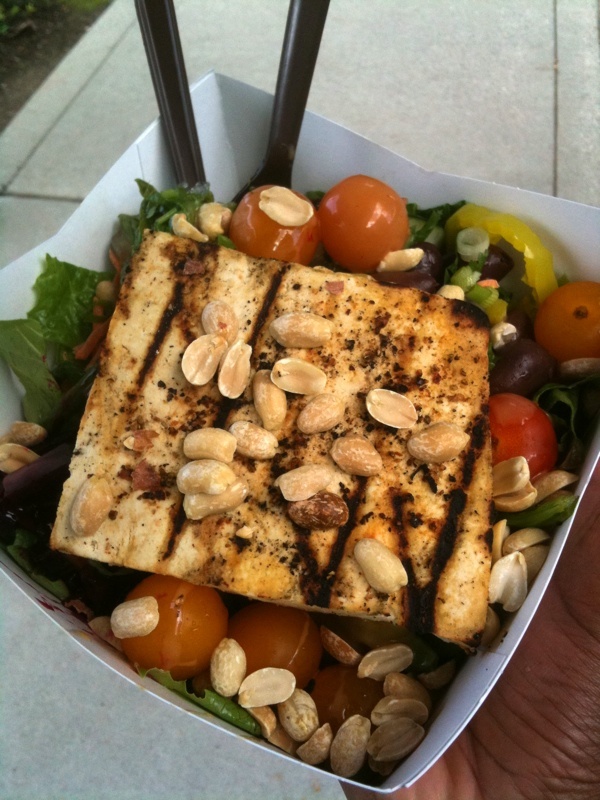 A typical lunch during the week, a super large salad with grilled tofu and peanuts at the cafe at work. Yes, we have an awesome cafe!